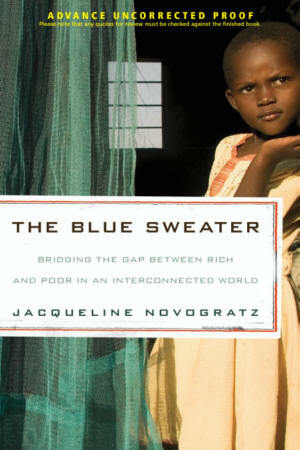 For Jacqueline Novogratz it all started back home in Alexandria, Virginia, with the blue sweater, a special gift that quickly became her prized possession—until the day she outgrew it and gave it away to Goodwill. Eleven years later in Africa, she spotted a young boy wearing that very sweater, with her name still on the tag inside. That the sweater had made its trek all the way to Rwanda was ample evidence, she thought, of how we are all connected, how our actions—and inaction—touch people every day across the globe, people we may never know or meet. It is this awareness that continues to drive her efforts to fight poverty worldwide. Like the best-selling Three Cups of Tea, this book at once is a deeply personal coming-of-age story of a young idealist determined to change the world c Novogratz relates her experiences over two decades, first in Africa and later in India and Pakistan. She began as a banker and philanthropist, and now works as a venture capitalist, trying to effect real change in countries where the average citizen lives on less than $4 a day. Reflecting the current trend toward socially responsible investing, THE BLUE SWEATER will inspire individuals seeking ways to contribute in a meaningful and effective manner. This is a wonderful book by a remarkable woman. It’s a story about doing enormous good while having some extraordinary experiences and even adventures. It touches the heart and the mind. I recommend it to anyone who wants to learn about what’s really going on in the world out there.